New Item! Expected to Ship 06-07-2019. Earn up to 21,112 reward points. 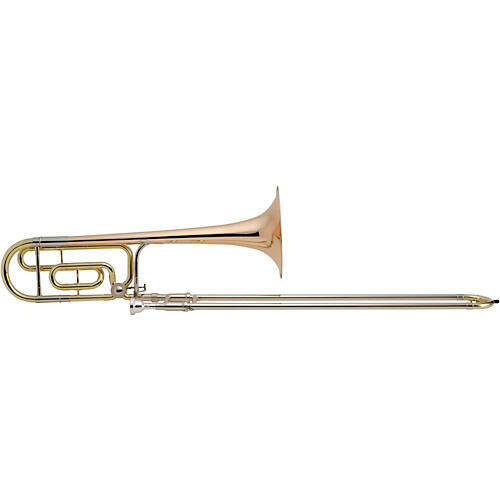 The King 4B Legend Series Trombone offers a classic large bore symphonic trombone design. The 4B features a .547-inch bore for a very free-blowing, open feel plus an 8-5/8-inch bell with a quick response and broad sound. The design of the 4B allows the player to push the boundaries without the worry of the tone breaking up. There is a lot about the King trombones that is legendary. With the 4B, it is the dynamic range that often tops the list of frequently mentioned attributes. It is broad and full in terms of timbre, and your forte sections have never sounded so robust. It is as quick and agile as it is broad and powerful, and has established itself as one of the truly great symphonic trombones. The King 4BF Legend Series Trombone is the seamless combination of the famous sound and projection of the King trombone with the enhancement of a traditional wrap F-Attachment. This trombone can handle a variety of musical styles with ease. Order today and be the sound your orchestra needs.